of the cast in wonderful backgrounds and wardrobe. Buy a calendar now and get a free sampling of delicious Downton Abbey tea. (tin not included). Factory sealed individual packets of Series 1&2 Downton Abbey Trading cards. Enjoy the fun of opening fresh packs to build your collection...or, buy a base set and then buy packs to treasure hunt in hopes of special cards such as wardrobes, autographs and variants. Did you know the Downton Abbey series had a special set all done in miniature, like the cigarette cards done in that era, which was the precursor to modern baseball and other collectible trading cards. They are so much fun, and randomly packaged inside the individual packets. ..and we all know how great the wardrobe was. Start collecting today and watch for special bundles and sets coming soon, as well as individual cards ! 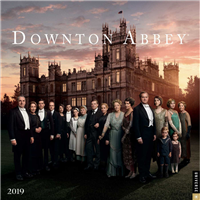 No longer in production, the Downton Abbey Series of trading cards encompassed Season 1 and 2 of the beloved television series in one run. Now considered a very hard to find collectible, we are making it easy for you to have a set by searching out the merchandise for you. These brand new unsealed binders includes the exclusive wardrobe binder card that came with it and as well, some extra pages for you to begin collecting. Watch for special bundles and sets coming soon, as well as individual cards ! An exceptionally hard to find factory sealed box of Downton Abbey Trading cards. Photo will be updated soon.